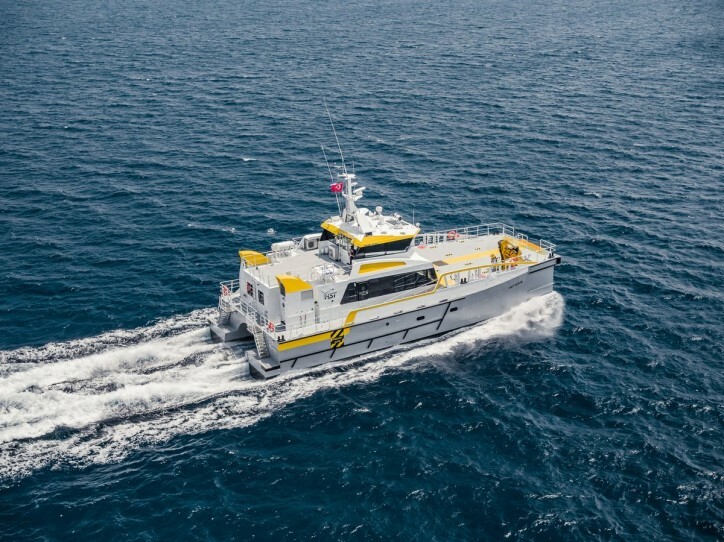 UK-based crew transfer specialist High-Speed Transfers (HST) has announced that its second vessel of Damen’s new FCS 2710 class will be contracted by Shell to support its exploration programme in the Black Sea commencing March 2019. Damen has long been in discussion with Shell and other oil majors on where and how to change the logistical mix for crew change purposes by accessing Damen’s portfolio of marine access solutions. An intensive, multi-disciplinary R&D programme attuned to industry input has resulted in Damen developing vessels that combine increased efficiency and safety with lower costs. HST began discussions via their broker, Clarksons Platou with Shell in mid-2018 regarding a collaboration. This initial pilot assessment of the benefits of reducing dependency on helicopters and larger OSVs to move personnel working on active drilling operations represents a paradigm shift for the oil major. Damen’s R&D department worked with Shell and the classification societies to provide the necessary technical data, and Shell has been closely monitoring the operations of the first FCS 2710, HST Hudson, since it entered service in July 2018. The FCS 2710 vessel will be trialled by HST to undertake oil & gas crew transfers to support the Noble Globetrotter II drill ship. The vessel will shortly begin an exploration drilling programme in the Khan Kubrat block, around 70 miles south-east of the Bulgarian port of Varna, where the HST Sofia will be based. The strength of the design is demonstrated by the fact that the HST Sofia is essentially identical to the HST Hudson, with just a few minor adjustments to the internal layout.